DF-H-2 Fully Hydraulic Portable Drill Rig is a kind of light rig designed for geological exploration in remote area difficult to enter. It is mainly suitable for diamond drilling with wire line coring technique. The rig consists of diesel power unit, hydraulic system, control panel, mast, main winch, wireline winch, drill head feed system, foot clamp, etc. 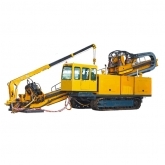 The rig is completely hydraulic driven for all its surface coring function. Fission style design makes the rig in good assemblability and disassemblability, facilitating transportation to most inaccessible areas. Robust structure plus exact control system ensures high penetration rate and outstanding reliability.